Victoria Findlay rode a bike on the beach on Hilton Head Island, SC on June 23rd. Both she and I cried! Tears flood my eyes tonight recalling riding beside her as she waved at everyone she saw, never ceasing to pedal what she called her “adult tricycle.” With a smile as wide as the ocean beside us, my Vicky (she prefers Victoria) followed my lead as we wove our way through the crowded beachgoers. Can you remember the first time you rode a bike? What if a drunk driver had taken that and many more precious things away from you years before? Would you seize a chance to reclaim that one stolen treasure? Would you ride and laugh and wave and give a friend like me one of the most touching moments of my life? Victoria did that for me this summer. That ride has elevated me to a higher level of understanding; a simple act of trust and love between friends. Luther and I first met Victoria Findlay and her parents, Fin and Carol Ann when her sister, Margaret and her husband, Tom moved to our small town of Beattyville, KY many years ago. The Findlays are originally from Los Angeles. They embraced us as family from the very beginning. Margaret, Tom and their children Jimmy and Meredith come to Hilton Head every year but this was the first trip for the Findlays. 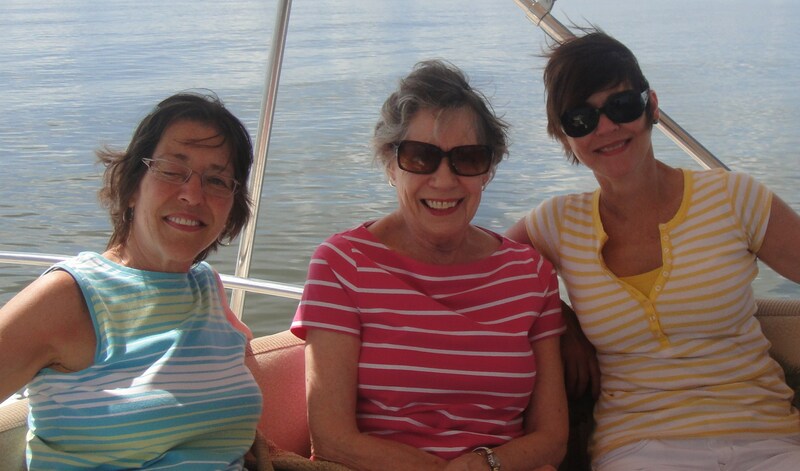 This photo was taken on our boat Papillon on our cruise to Savannah. Victoria is on the left, Carol Ann in the middle, and Margaret on the right. A trio of remarkable women for sure! Carol Ann has a rare sense of compassion. I’ll never forget our trip to visit all of them in Longview, WA only months after Drew and Jeremiah passed. Racing away from a life we no longer knew, we fled west. The Hickeys and the Findlays surrounded us with love and family. Although Jordan was only eleven, I know that trip was as healing for him as it was for us. Last June, we attended Jimmy Hickey’s high school graduation in Portland, OR. Jimmy is our godson and we were thrilled to be included in the celebration. Jimmy is a gifted photographer. Check out his website www.jimmyhickey.com One afternoon Luther coaxed Margaret’s father, Harold (Fin to us) to talk about his service in World War II. He had enlisted at eighteen and volunteered to deliver messages on motorcycle without even knowing initially how to ride a motorcycle. His forays into enemy territory often had his superiors keeping his dog tags because they expected him not to return. Fin produced an amazing photo where he is sitting on an Indian motorcycle fitted with a rifle. Luther had an idea for a surprise for Fin and Carol Ann for their trip to Hilton Head. 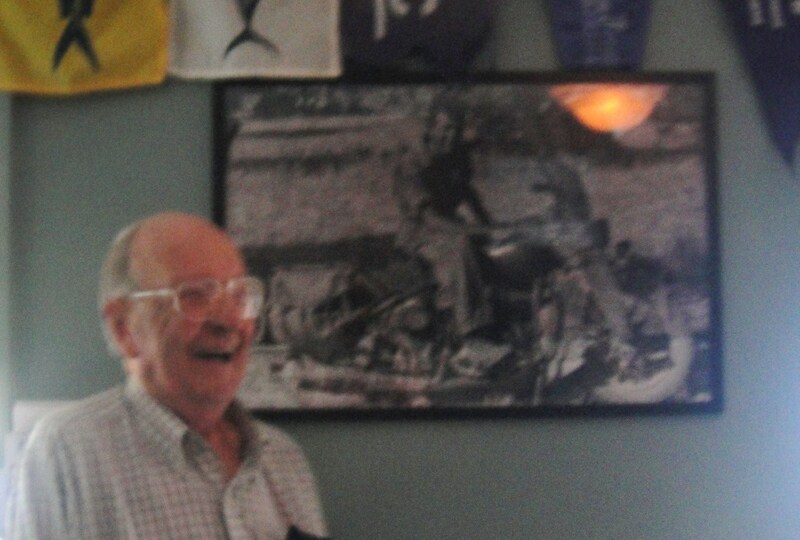 We enlarged Fin’s motorcycle photo and had it displayed in a local restaurant. On the way to dinner one evening, we made a stop. Carol Ann was the first to say, “That photo looks like Fin.” Fin glanced over and said, “That does looks like me with hair!” Don’t you love to pull off a total surprise? Much like Victoria riding her bike, it was quite a joyous time. I’ve included a picture I took that night of Fin with what has become a famous photo on Hilton Head. Victoria wrote us a note when she returned to her home in Corvallis, OR. I want to share a part of what she wrote. I will carry this note with me forever. I will never forget the love and compassion the entire Hickey and Findlay families have shown us over the years.